The Silver Edit is a contemporary editorial that captures stark, metallic garments in urban environmental spots. Dark, eerie walkways, metal grid bridges and city garden paths set the tone for the editorial - creating a juxtaposition of elegance and unrefined. The Silver Edit features pieces from the A/W 18 collections of designers such as Maison Margiela, MM6, Raf Simons, Calvin Klein and Paula Knorr. 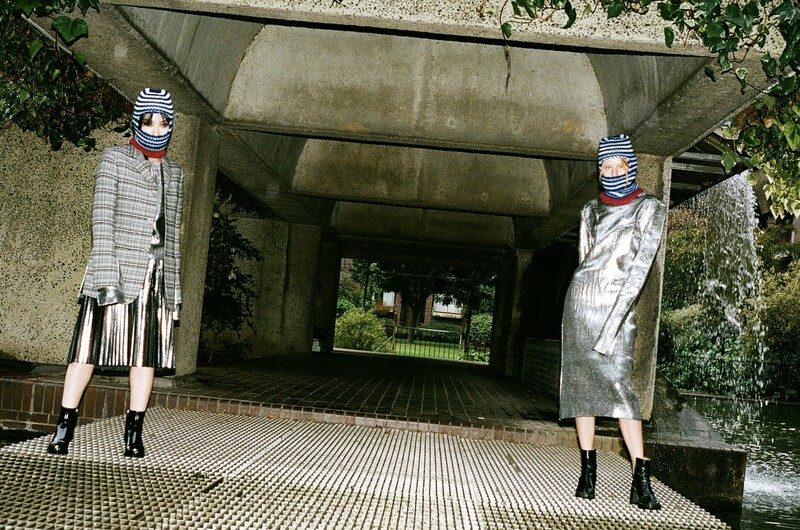 Silver metallic dresses by MM6 embody glamorous suits of armour, paired with colourful knitted balaclavas by Calvin Klein further portraying the aspect of a ‘Modern Day Knight’. In a confined concrete cave, water falls heavily forming liquid walls encapsulating the beautiful reflective properties of the dress material. The undoubtedly eye-catching and outlandish look is captured perfectly in the unforeseen setting, truly evoking the garment's full potential.